COLUMBUS GROVE – With Colmbus Grove’s win over Delphos Jefferson Tuesday, the Bulldogs are one league win away from capturing their fourth straight Northwest Conference title. A win against Ada Thursday would give Columbus Grove a share of the NWC crown with Spencerville and Bluffton depending on how those two teams fare in their final conference clashes. And while this is a pretty impressive accomplishment, Columbus Grove head coach Brian Schroeder sees this as a league title for the current team. Schroeder sees this season in three parts. In the early going, Columbus Grove broke out to a quick 6-0 mark. However, the Bulldogs went through a tough patch, primarily against their Putnam County neighbors, losing five out of seven. The losses were to Kalida by two, 41-39, Ottawa-Glandorf, 43-37, Ottoville 49-33, Spencerville 31-30 and Liberty-Benton, 53-27. But after the loss to Liberty-Benton, then the No. 1 team in the state, the Bulldogs have reeled off six straight wins as they head into its final two games against Ada (2-19, 0-7) Thursday night followed up with its season closer against PCL rival Pandora-Gilboa. 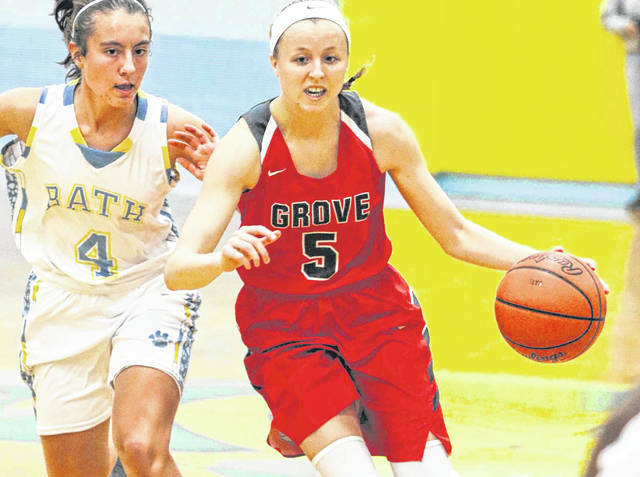 Coming into the season, Columbus Grove had two seniors, Rylee Sybert and Amy Vorst, and a host of other players who got additional playing time after standout Paige Bellman went down with an injury. Despite the loss of Bellman the Bulldogs rallied to win the NWC title for the third straight time before bowing out in the playoffs. Schroeder said winning without Bellman was instrumental in the growth of some of his players but also pointed out that this year they would probably find themselves in different roles. Schroeder added that last season he did not anticipate Abby Gladwell at the varsity level but due to injuries she was called on off the bench who could provide some solid defense. This year she has become a starter and the team leans on her for more contributions this year and she has not disappointed. Schroeder credits the team’s senior leadership for keeping the Bulldog winning ways going. Sybert leads the team in scoring as she averages around 12 points a contest. Also emerging this season is Kenzie King who is averaging around 10 points a game, along with Angel Schneider, who has contributed on both ends of the court. Defense has also played a vital role in the Bulldogs success. Schroeder said despite lack of size, the tallest Bulldog is 5-8 on the roster, the team is scrappy and put on a lot of pressure on opponent’s ball handlers in order to produce transition buckets off turnovers. Even though the Bulldogs appeared to put things together in the latter half of the season, Schroeder said the team is working on playing a little cleaner and avoiding turnovers. This is vitally important during the tournament. Schroeder said this past Saturday, the Bulldogs turned the ball over 20 times and he knows that is way too many and it could be a determining factor during the postseason. On defense, Schroeder said rebounding and handling much taller post players will be a priority as well. Before the postseason, Schroeder wants to end the regular season on a high note and admits his primary focus is on beating Ada followed by beating Pandora-Gilboa before the postseason. “We really do try to take it one game at a time there is a lot of truth to it,” Schroeder said.